The City Council will hold a Work Session and Regular Session on Thursday, March 21, 2019 at 6:30 pm in the Council Chambers at the Joshua City Hall located at 101 S Main Street, Joshua, TX. This meeting is open to the public and subject to the Open Meeting Laws of the State of Texas. The Planning & Zoning Commission will hold a Regular Meeting on Monday, March 4, 2019 at 6:30 pm in the Council Chambers at City Hall located at 101 S Main Street, Joshua, TX. This meeting is open to the public and subject to the Open Meeting Laws of the State of Texas. The agenda and meeting packet may be found in the Current Agenda Folder on the Planning & Zoning Page. The City Council will hold a Work Session and Regular Session on Thursday, February 21, 2019 at 6:30 pm in the Council Chambers at the Joshua City Hall located at 101 S Main Street, Joshua, TX. This meeting is open to the public and subject to the Open Meeting Laws of the State of Texas. The Planning & Zoning Commission will hold a Special Meeting on Thursday, February 21, 2019 at 6:00 pm in the Council Chambers at City Hall located at 101 S Main Street, Joshua, TX. This meeting is open to the public and subject to the Open Meeting Laws of the State of Texas. The City Council, Type A Economic Development Corporation, and the Type B Economic Development Corporation and Parks Board will hold a Joint Work Shop and Regular Session on Thursday, January 17, 2019 at 6:30 pm in the TRAINING ROOM at the Joshua Fire Station located at 770 N Main Street, Joshua, TX. This meeting is open to the public and subject to the Open Meeting Laws of the State of Texas. The Zoning Board of Adjustment / Building Board of Appeals will hold a Regular Session on Thursday, January 10, 2019 at 6:30 pm in the Council Chambers at City Hall located at 101 S Main Street, Joshua, TX. This meeting is open to the public and subject to the Open Meeting Laws of the State of Texas. You may bring your Christmas tree to the Public Works Facility on January 4, 2019 from 12 pm to 5 pm for mulching. The Public Works Facility is located at 104 W 12th Street. Waste Connections has added extra routes and trucks in the Joshua area and therefore trash collection will happen earlier than usual. Please make sure that your trash is placed out for collection no later than 7 am on collection day to ensure that your garbage will be collected. Should you have any questions, please call City Hall at (817) 558-7447. The City Council will hold a Work Shop and Regular Session on Thursday, December 20, 2018 at 6:30 pm in the Council Chambers at City Hall located at 101 S Main Street, Joshua, TX. This meeting is open to the public and subject to the Open Meeting Laws of the State of Texas. The Tax Increment Financing (TIF) Board will hold a Regular Meeting on Thursday, December 20, 2018 at 6:00 pm in the Council Chambers at City Hall located at 101 S Main Street, Joshua, TX. This meeting is open to the public and subject to the Open Meeting Laws of the State of Texas. The Animal Control Advisory Board Commission will hold a Regular Meeting on Monday, December 10, 2018 at 6:30 pm in the Council Chambers at City Hall located at 102 S Main Street, Joshua, TX. This meeting is open to the public and subject to the Open Meeting Laws of the State of Texas. The agenda may be found in the Current Agenda Folder on the Animal Control Page. The Planning & Zoning Commission will hold a Regular Meeting on Monday, December 3, 2018 at 6:30 pm in the Council Chambers at City Hall located at 101 S Main Street, Joshua, TX. This meeting is open to the public and subject to the Open Meeting Laws of the State of Texas. The City Council will hold a Work Shop and Regular Session on Thursday, November 15, 2018 at 6:30 pm in the Council Chambers at City Hall located at 101 S Main Street, Joshua, TX. This meeting is open to the public and subject to the Open Meeting Laws of the State of Texas. The Planning & Zoning Commission will hold a Regular Meeting on Monday, November 5, 2018 at 6:30 pm in the Council Chambers at City Hall located at 101 S Main Street, Joshua, TX. This meeting is open to the public and subject to the Open Meeting Laws of the State of Texas. Joshua Police Department will be participating in the DEA National Take Back Day program on Saturday, October 27. The Take Back is created as a safe way to dispose of any unwanted, unused or expired prescription medications in your home. 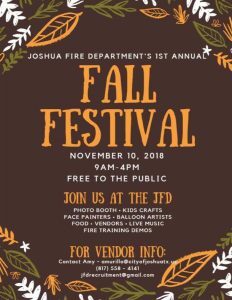 Officers will be set up at the Joshua YMCA from 10 am until 2pm. The City Council will hold a Work Shop and Regular Session on Thursday, October 18, 2018 at 6:30 pm in the Council Chambers at City Hall located at 101 S Main Street, Joshua, TX. This meeting is open to the public and subject to the Open Meeting Laws of the State of Texas. The Type A EDC will hold a Regular Meeting on Monday, October 8, 2018 at 6:30 pm in the Council Chambers at City Hall located at 101 S Main Street, Joshua, TX. This meeting is open to the public and subject to the Open Meeting Laws of the State of Texas.